The building of Hadrian’s Wall began in AD122 and took six years to complete. The wall stretches 73 miles (80 roman miles) from Segedunum at Wallaend on the River Tyne to the shore of the Solway Firth just west of Bowness-0n-Solway. 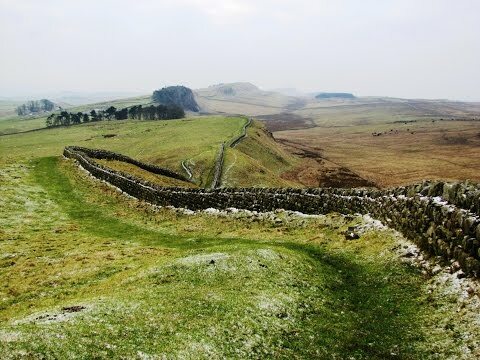 The famous Roman wall was built as a defensive fortification during the rule of Emperor Hadrian, who gave the orders to build the wall, and follows the northern escarpment of the valleys of Tyne, Irthing and Eden between Newcastle and Carlisle. To the East of the River Irthing the wall was made from squared stone and measured 3 metres wide and 5-6 metres high but to the west of the river the wall was made from turf and measured 6 metres wide and 3.5 metres high. Over 80 Milecastles or forts, each with a kitchen and barracks for a small garrison, were built along the wall, a mile apart as well as two observation towers. Seventeen larger forts with large gates were also built into the wall which held 500 to 1,000 troops, infantry or cavalry. To the south of the wall the Roman’s dug a wide ditch or vallum with 6ft high earth banks because they were afraid of the Brigantes tribe of northern England might join up with the tribes of Lowland Scotland. The Hadrian’s Wall Path National Trail runs through the World Heritage Site and passes through rugged moorland, rolling fields and over hills giving spectacular views. The longest continuous section of the wall still visible today is to the east of Birdoswald Fort and is well worth the walk with the part between Birdoswald and Chesters giving the best scenery. The forts of Birdoswald and Housesteads have a visitors centre and museum and the forts of Chesters and Corbridge have museums, so making a great day out. Hadrian’s Wall became a World Heritage Site in 1987 and 6 miles of the wall from Housesteads to Cawfields Quarry to the west is owned by the National Trust. Access and rights of way to the wall from the car parks at Housesteads, Steel Rigg and Cawfields are operated by the Northumberland National Park Authority. Housesteads Roman Fort, which was once garrisoned by 1,000 soldiers, is the most complete roman fort in Britain and stands commandingly high on the exposed escarpment of Whin Sill. Along with Chesters it was one of the permanent forts added to the wall around AD 124 it covers an area of 5 acres and the layout changed very little over three centuries of occupation. Housesteads is aligned towards the rising sun rather than towards the enemy making the east gate the main gate and the deeply worn wheel ruts are still visible. The ruts exactly 1.4m apart is the same as the width for the British standard railway gauge. Housesteads is owned by the National Trust and managed by English Heritage. We park at Steel Rigg car park then walk out of the car park and turn right down the road. At the dip in the road we go through the gate or over the stile on the right and follow the track and way markers. Hadrian’s Wall can be seen on top of the hills on our right going into the distance. We pass close to the trees of Peatrigg Plantation on our left and then a barn on the other side of the wall and keep heading forward. Soon Crag Lough below the vertical crags and Hadrian’s Wall is on our right and as the wall on our left turns left near two barns we keep heading forward through a gate in the fence line and then over two small footbridges and head towards the gate in the next fence. We go through the gate and turn left onto the track which bears to the right. We keep following the track until we see a yellow marker on a small post on the right pointing towards some trees. We head towards the left of the trees with Hadrian’s Wall still on our right. Keeping the trees on our right, we cross over the remains of a wall and Greenlee Lough can be seen on our left. We keep heading forwards along the track going through two gateways towards a plantation with a yellow marker. We go over the stile into the plantation and then over the stile at the other end. We make our way forwards and slightly right towards Kings Wicket, a gate on Hadrian’s Wall, on our right. We go through the gate at Kings Wicket and turn right we now follow Hadrian’s Wall path also the Pennine Way until we reach a wide part of the wall with Housesteads just in front. We drop down off the wall via a stone stile and walk down the field and turn right through the gate and immediate left over the small bridge over a stream. We follow the path along the side of Hadrian’s Wall with the fort ruins on the other side. We then go up some steps on our left go over the stile then cross over Hadrian’s Wall and go through the gate opposite. We walk forward downhill to the Visitors Centre where there is a museum and public toilets. We then enter the fort ruins to explore and the entrance fee is £5 each. We then return to the gate at the top of the hill at Hadrian’s Wall, go back through the gate and turn left onto the wall. We now walk on the wall until we reach a gate where we drop down off the wall and head forwards following the well worn and clearly marked track. We pass Milecastle 37 and then there are two tracks one that follows very close to Hadrian’s Wall on our right and one a little further to the left. Both tracks merge at the top of the hill just before the farm with Crag Lough down below. We walk downhill past the farm and Milecastle 38 then carry on forward along the farm track we can see in front of us. We come to a small road with a sign post we cross over the stile and head uphill towards the top of the crag and through the trees above Crag Lough the wall is now on our left. We come out of the wood and head forwards to the end of the crag and then walk very steeply downhill cross over the wall at the bottom and then walk very steeply up the stony steps to the top with the wall back on our right. We keep following the wall going downhill passing Milecastle 39 until we come to a stile in the wall on our right. We go over the stile and head steeply downhill to a wall on the left. We keep close to the wall and ignoring the gate and footpath on the left we head uphill following the path towards the trees and to the car park at Steel Rigg. NB: Housesteads Visitors Centre and Museum are closed for the winter due to refurbishment and will re open in spring 2012.The ruins remain open. This is a moderate to hard walk with some steep inclines and declines and is quite boggy on lower ground. Good waterproof boots are recommended. Approx 6.75 miles using OS map OL43. Steel Rigg car park is near Greenhead in Northumberland. From Carlisle take the A69. After passing Brampton take the B6318 on the left sign posted Greenhead and Gilsland. At Greenhead turn first right going over the railway bridge. Carry on for approx 6 miles then just after the Twice Brewed pub take the first left turn and follow the road uphill and the car park is on the right. There are public toilets at the car park and picnic area next to the Twice Brewed pub and also at Housesteads visitors centre and museum. For refreshments there is the Twice Brewed pub and at Housesteads there is a shop and picnic area. There are also toilets and plenty of pubs, restaurants, cafes and shops at nearby Haltwhistle, Brampton and Hexham. If some one wants expert view about running a blog agter that i recommend him/her to go to see this weblog, Keep up the pleasant job. to find out howw you center yourself and clear your mind prior to writing. I truly do take pleasure in writing however it just seemss like the first 10 to 15 minutes are generally lost simply just trying to figure out hoow to begin. Any ideass or hints? Cheers!